A lot of creating was going on Sunday, but it was my kids, not me. 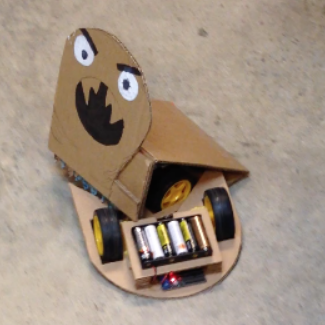 We joined a newly formed “cardboard battlebots” club and got started on our kit and getting all the information for programming and controlling the bots loaded (mostly) onto our computer and phones. Two bots were working by the end of the session and got to duke it out. The bots are randomly assigned an animal and what you see here, is “hookworm”. Our bot is “goose”. 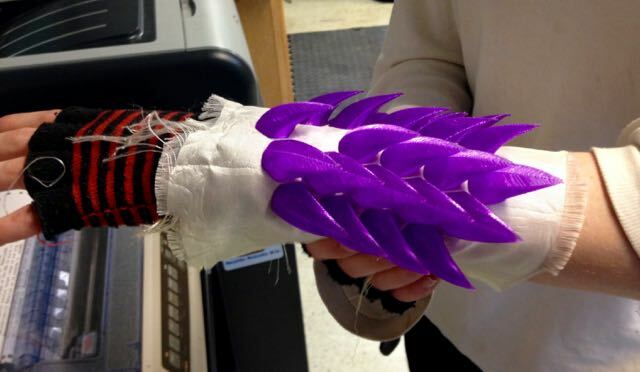 And while we were poking around the Maker space, we found this really cool idea: scales 3-D printed onto fabric. We’ve seen scales hand-sewn into gauntlets which looks extremely time consuming, if this works out, it might be a much cheaper way to achieve that effect. Added: video of the bots fighting. How?!? did I miss this place? I looked for something like this when we first moved because it was a favorite place of ours back home in CA, but I didn’t find anything. Thanks for the lead!! I find all the cool stuff 🙂 There’s another one in Everett, but I think this one seems more kid friendly. Next battlebots is May 20, but I think we will be on a 4-H trip that weekend.